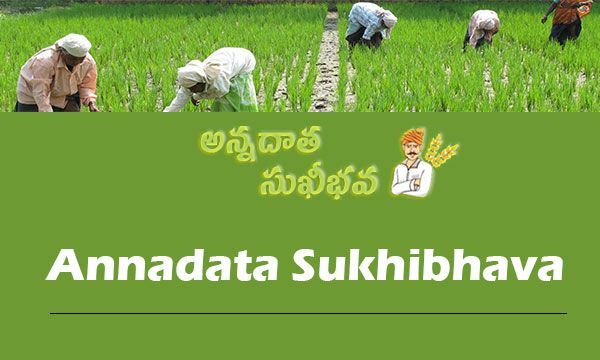 Annadata Sukhibhava Payment/Amount Status Check Online: AP Annadata Sukhibhava scheme was launched by Andhra Pradesh state government to offer financial support to the farmers. Under this scheme, the farmers with land up to 5 acres will get Rs 9000 and farmers with more than 5 acres of agricultural land will get Rs 10000. The Government of Andhra Pradesh is spending over Rs 7000 cr to provide financial aid for the farmers. Farmers who are residing in Andhra Pradesh state can check the registration details, and what are the benefits of this scheme, and other details from this article. The government of Andhra Pradesh launched the Annadata Sukhibhava scheme on 18th February 2019. Government of Andhra Pradesh hereby ordered to extend the financial assistance of Rs.15,000/- per year per farmer family. The farmer families who were covered under PM-KISAN will be extended additional benefit of Rs.9,000/- per year and all other excluded farmer families under PM-KISAN will be assisted with Rs.10,000/-. Immediate assistance of Rs.4,000/- to all farmer families shall be given by March, 2019 @ Rs.4,000/- per farmer family. The farmer is defined as per the guidelines of PM-KISAN. The tenant farmer families will also be extended the benefit of Rs.15,000/- per year and first disbursement for Tenant farmer shall be done during Khariff, 2019. Farmers can avail the benefit of this scheme by registering with the Annadata Sukhibhava website, annadathasukhibhava.ap.gov.in or from the Annadta Sukhibhava mobile app to avail the benefits offered by the state government. Andhra Pradesh State government is offering financial support for the eligible farmers through Annadata Sukhibhava scheme. AP State government has assigned the responsibility of preparing a list of Annadata Sukhibhava Scheme village wise & Mandal wise to Real Time Governance Society (RTGS). RTGS stated that 53,45,097 beneficiaries will get the announced money under this scheme. While the state government has released the funds to 46,13,432 accounts. In phase I, AP Government has released the funds for 46,13,432 beneficiaries, amount of 461.3432 Cr and Phase II, funds for 44,96,118 beneficiaries, amount of 1348.8354 Cr. అందరికీ అన్నం పెట్టే రైతు కు పెట్టుబడి సాయం ఇవ్వటం కోసం ప్రవేశపెట్టిన అన్నదాత – సుఖీభవ పధకం ద్వారా మొదట విడత రూ.1000 మరియు ఇప్పుడు రెండవ విడత గా మీ బ్యాంకు ఖాతా లో రూ.3000 జమ చేయబడినది. త్వరలో తదుపరి విడతల్లో మీకు మరింత సాయం అందించబడుతుంది. వివరాలకోసం ప్రజలే ముందు మొబైల్ అప్లికేషన్ నందు http://bit.ly/PeopleFirstCitizen లేదా annadathasukhibhava.ap.gov.in వెబ్ సైట్ ను సందర్శించండి. సమస్య/సందేహం ఉంటే 1100 కు కాల్ చెయ్యండి. ఆంధ్ర ప్రదేశ్ ప్రభుత్వం. The first phase of payments to beneficiaries will be made by March, 2019. And in the 1st phase, the Government of Andhra Pradesh will make the payments for 46,13,432 farmers. The AP Government has paid to 53,45,097 accounts as of now. The farmers can check their payment details by using their Aadhar card numbers. The payment will be done through DBT method. The amount will be automatically credited to the beneficiary’s bank accounts. The Second phase of payments to beneficiaries will be made by 3rd April, 2019. And in the 2nd phase, the Government of Andhra Pradesh will make the payments for 44,96,118 farmers. The AP Government has paid to 53,45,097 accounts as of now. The farmers can check their payment details by using their Aadhar card numbers. The payment will be done through DBT method. The amount will be automatically credited to the beneficiary’s bank accounts. The RTGS is under progress to prepare Village, Block & Mandal Wise beneficiaries list. The work will be completed within 15 days or by the end of February. Soon, the AP State Government will announce the list of beneficiaries and the amount will be credited by the end of April. Step 2: Now on the homepage, click on “ANNADATHA LOGIN” Button. Step 3: You need to search their payment status by entering their Aadhaar No. or by entering their Mobile No. Select Aadhaar Based or Mobile Number Based Option. Step 4: Enter Your Details, Click on Send Button and verify. Step: 5 Once OTP Verified Successfully, your Reports will be displayed on the screen. Applicants can see their following payment status on their screens. Real Time Governance Society (RTGS) prepared the list of Annadata Sukhibhava Scheme village wise & Mandal wise. In this list, eligible farmers to get the funds under Annadata Sukhibhava scheme will be mentioned. The beneficiaries in this list can claim their fund by visiting the Annadata Sukhibhava portal or app. The application form will be accessible on the same. The Government Andhra Pradesh will automatically process the financial aid to the families listed in the RTGS list. No specific application is required to get the Annadata Sukhibhava benefits. Annadata Sukhibhava Scheme beneficiaries list will be prepared Village, Block & Mandal Wise. The total number of a beneficiary under the scheme is 54 lakh. The cost of the Scheme is Rs 7000 crore. Real Time Governance Society (RTGS) is responsible to release the list of beneficiaries for Annadata Sukhibhava scheme. RTGS Village, Block & Mandal Wise list will be submitted to the state government to implement the scheme. The list of beneficiaries is going to be prepared in 15 days or last of February 2019. The government will pay the first installment by March-end. The government will pay the Second installment by April-end.